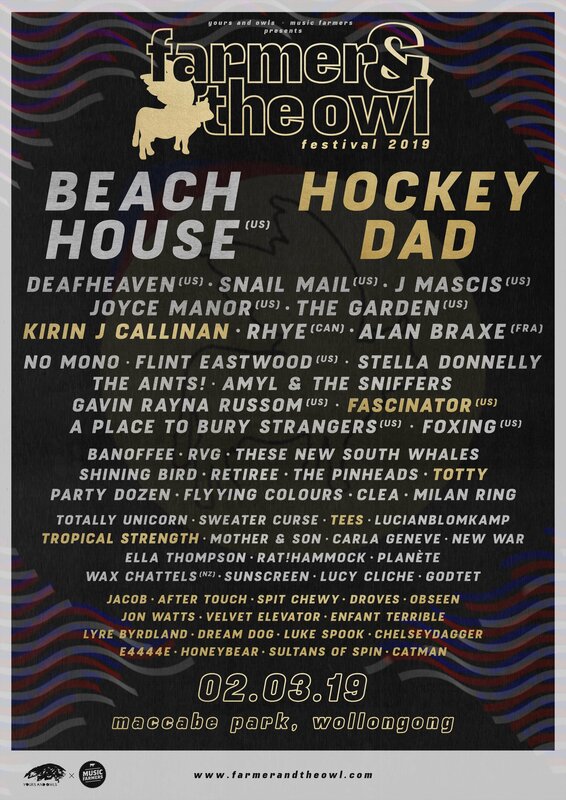 Farmer and The Owl Festival is set to become the tastemaker’s music festival of choice. Thoughtfully curated by the Farmer and The Owl label family of Hockey Dad, Totally Unicorn, The Pinheads, TEES and Tropical Strength, to quench the thirst of the music lover who is searching for that sense of discovery, the high of the unknown and the buzz of falling in love with fresh sounds that are yet to saturate the mainstream. Farmer and The Owl Festival heterogeneous line up has just expanded, featuring a list of local talent that will blow your collective musical minds……you can watch the line up video here and listen to the official Spotify playlist here. Wollongong’s Hockey Dad have just been going from strength to strength with the release of last year’s sophomore album Blend Inn. The triple j featured album includes foot stomping, catchy-as-hell lead singles ‘Join The Club’, ‘Homely Feeling’ and ‘I Wanna Be Everybody’, and cements the childhood friends as a force to be reckoned with. The globe-trotting duo have travelled extensively through North America playing headline and support shows, including showcases at SXSW and a Canadian tour with Dune Rats. They have performed across the UK, Europe, and further across Australia as the main support on the 25+ date tour for iconic Aussie rock band Grinspoon, plus more shows alongside Dune Rats and Wavves in some of the country’s biggest venues - a world away from the 70-cap band room where Hockey Dad first cut their teeth. Walking the fine line between poseur and provocateur is what makes Kirin J Callinan such a fascinating artist. His 2017 second album Bravado gained attention overseas with massive track ‘Big Enough’ which has clocked up over 3 million streams on Spotify. The past few years have seen Callinan tour the US with Pond, the UK with Mac Demarco, make his acting debut in acclaimed director Jane Campions "Top of the Lake" series 2, and arrive at Splendour in the Grass with a stage full of collaborators. This follows a cycle of recording and touring internationally that includes opening for Tame Impala at the celebrated Hollywood Forever Cemetery shows, a glittering set at Paris Pitchfork festival, lifting the funkadelia across both the Mark Ronson album and live shows, and opening for Crowded House at the sold-out Opera House forecourt shows. Dreamy two-piece house-pop outfit TEES will be bringing the nostalgia with their 90’s acid-soaked dancehall vibes of ‘Got The Feeling’. Forging their platonic love from a carefully constructed cup of tea, the Sydney duo will carefully set you down on a bed of clouds with their lusciously ethereal track ‘Playground’. Creating their own path of music that reminds all who listen of a time and a sound that cannot easily be defined.